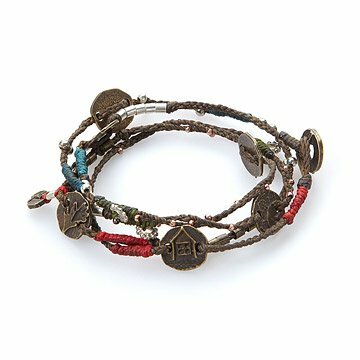 This bracelet wraps around the wrist three times and is threaded with charms that represent your wishes. What future do you dream of? You might find it in this funky, wraparound bracelet. Long enough to loop three times around your wrist, it's threaded with illustrated metal charms, with each image offering a symbolic reminder of your brightest wishes. Perhaps to you the hand charm means friendship, or maybe it suggests hard work. The garden charm could represent abundance, personal growth, or a goal to eat healthier. Made from waxed synthetic cord and accented with metal beads and clasps, each time the bracelet catches your eye, the dreamlike images will bring your mind back to an awareness of your core values and aspirations. Handmade in Guatamala. Recommended wrist size 3" dia or smaller. Size varies due to handmade nature. I have missed wearing this bracelet after it finally broken after I wore it daily for years. I NEVER took it off! Love it! I have no complaints. I am so happy with my purchase. I love this bracelet. My daughter, niece and I all wear one. Great gift. Unique and beautiful bracelet. This is the third person that I have purchased for and everyone loves it. Loved, loved, loved it when it arrived - so now i have to have one too! Very fun gift for a teenager too.